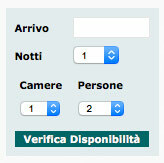 to proceed to check-in online, you must complete the following form in every space. Check in online, it will be been successful only after successful confirmation of Hotel Management. Please note that the originals of the documents, should always be performed when you arrive at the hotel. Who does not make the check-in online and get beyond h.19:00 will not take possession of the room. The customer authorizes the Mini Hotel to withdraw the total amount including taxes, all to be charged to the credit card provided as guarantee.